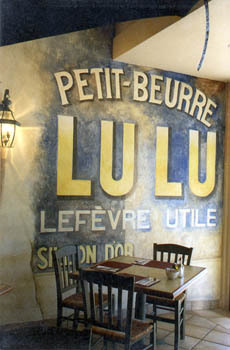 European glazed walls and distressed Affiche French advertising inspired this bistro Provençal look. Client: wanted a fresh, casual atmosphere reminiscent of South of France. The floor is tiled. A working fountain adds to the charm created by the wall murals and treatment. Specifics: All murals, finishes and painted architectural elements. Acrylics.